Our first AGM in September was a rousing success. It was great to meet so many of our supporters in person, and to share lots of ideas – a summary is available below (official minutes will be published at the next AGM). The big news is that the date of the next Comprehensive Spending Review has been pushed back to 2014, so we now have more breathing space to work out exactly how we will fight spending cuts when the time comes. The consensus at the AGM was that we want to continue with science funding as our main focus, extending our influence by setting up local chapters, and that when we do rally for science spending, we’d like to do it UK-wide. If anyone is interested in coordinating with Science Is Vital on a local level, please do get in touch, by emailing jenny[at]scienceisvital.org.uk. The first Science is Vital Annual General Meeting took place on 13th September 2012 at the Christopher Ingold Lecture Theatre at UCL in London. A lively group of about 70 people turned up to hear Professor Colin Blakemore FRS and Imran Khan, Director of the Campaign for Science and Engineering (CaSE), speak about the threat to science funding and to discuss ways that Science is Vital can fight that threat. 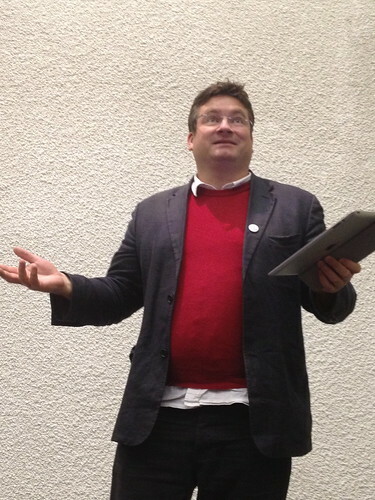 Sandwiched within were a series of reports and elections from and for the Science is Vital executive, topped off with a typically geeky and hilarious performance by comedian Helen Arney, followed by a trip down the Jeremy Bentham to slake our typically scientific thirsts. The most important part of the meeting was the discussion of how SiV could progress over the next couple of years until the forthcoming Comprehensive Spending Review (expected in 2014). It was acknowledged that one reason for our 2010 success was our single issue focus. Whilst it is tempting to stray from that focus in order to keep up momentum for the campaign the consensus seemed to be that keeping our efforts fixed on the public funding of scientific research is key. People felt that our broad support base was a great strength of the campaign. We should continue to work to broaden that base through contacting companies and institutes like hospitals and asking them to spread the word about the campaign. Science takes place outside London. MPs represent constituencies. There is a lot of support for SiV in universities around the country. It was clear that the more that supporters can do around the country to campaign on the issue the more pressure we can place on MPs to support the campaign and to build numbers of supporters. It is important that we remain focussed on the key targets for our campaign. In 2010 that was the Treasury. At the next CSR it may be the same. However, it cannot hurt in the meantime to convince as many MPs as possible about how Science is Vital and the political cost to them (and any Prospective Parliamentary Candidates) of not supporting science. Anna Zechoria outlined her plans to invite MPs local to labs at Imperial College in order to convince them of science’s vitality and open lines of communication. Whilst no-one felt that SiV was best placed to build the evidence base alone, we could support that process either financially or through using our supporter base to conduct surveys showing the grassroots effect of cuts to science funding. It is now up to the SiV executive to work out how to help supporters set up local chapters and pressure their MPs, and to build the evidence base. 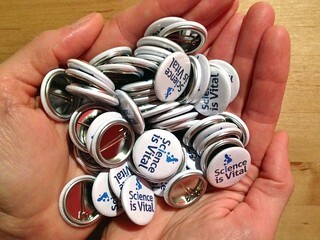 Science is Vital pin badges—only available here!